When I was in college, I spent a semester in Denmark studying architecture. Part of our education was to pile into those tourist busses with the grey and maroon carpeted seats and be driven around to endless architecturally significant landmarks, where we’d tumble out, sketch furiously for 40 minutes, then pile back on to the bus. Often these were day trips, requiring us to get there before daybreak, returning home long after dark with notebooks full of our visual education. A few times though we’d take longer trips, driving off the island of Sealand and onto the peninsula (which involved driving the bus onto a ferry, which we all thought was super cool), or even further afield to places like Berlin and Amsterdam, endlessly exposed to the richness of the built, European world. While I certainly have important and enriching memories of all of the places we were shown that still influence the way I think about urban planning and my career to this day, we also had significant amounts of down time on the bus, that whole business of getting from one place to another. One day, nearing the end of a long study trip and deep into a long and boring afternoon of driving, we were in a particularly rural portion of the countryside and the afternoon light had lulled nearly everyone either into a nap. Suddenly the bus pulled to the side of the road and our sleepy heads lifted in curiosity. The director of our school was at his summer home, we were told, and had called us urgently needing some papers that we had on the bus, so we were to take a detour to his summer house to deliver them to him. After an hour or so of increasingly complex turns and smaller and more rural roads, the bus stopped again and we got off to stretch our legs while the papers were delivered to the house. But there was no house, only a large, grass covered mound. Confusion abounded. Was THAT his summer home? Was it underground? Just where were we, anyway? Were we being set up to die alone in the bucolic Danish countryside? (I could think of worse ways to go). The mound, it turns out, had a doorway, and our fearless leaders ushered us inside, though we could barely see in the dank and stale darkness, and our large group barely fit in the tiny cramped space. The door was closed to the early fall sun and we stood, nervously, in that cool and utterly quiet underground space, for a moment or so. Suddenly, a match was lit, and small halos of light appeared as candles were lit and passed around. Small glasses of pungent-smelling liquid were being poured passed around, one for each of us. When the space was fully lit and everyone had a glass, we were told, reverently, we were in an ancient Viking burial mound, that the liquid we had in our hands was called aquavit, a traditional festive Scandinavian spirit that originated in the 1500’s. This was our rite of passage, after which we could say we had truly experienced Danish culture. Sköl! Aquavit smells of anise and caraway, and is bracing and powerful, hitting you in the face the same way as that (in)famous Danish favorite, salted black licorice. Plenty of people take one whiff and won’t touch the stuff, but I find that the assertive flavor is actually quite complex and appealing, a lot like other digestif-style liqueurs such as Fernet. You can drink it as is (ice cold, of course), or mix it in a cocktail, if you’re brave. 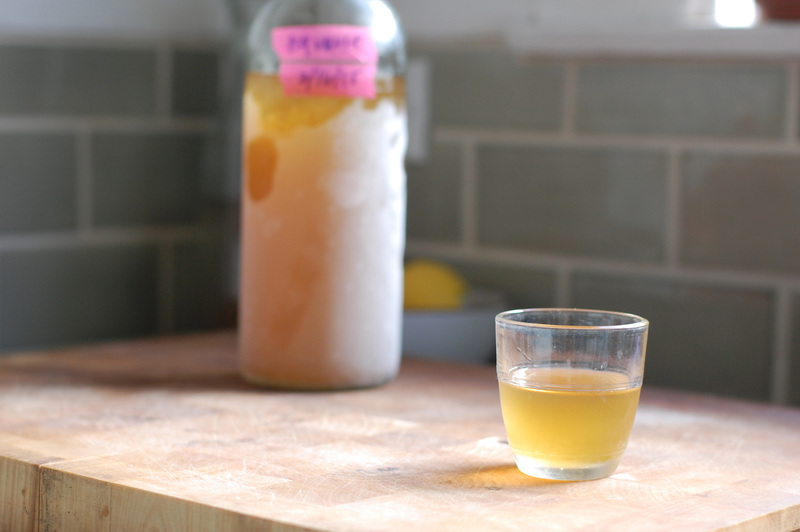 There are a few good brands you can buy, but I like to make my own aquavit-like liqueur, which is quite easy to do at home. This post is a two-for-one (or three if you count my story!) 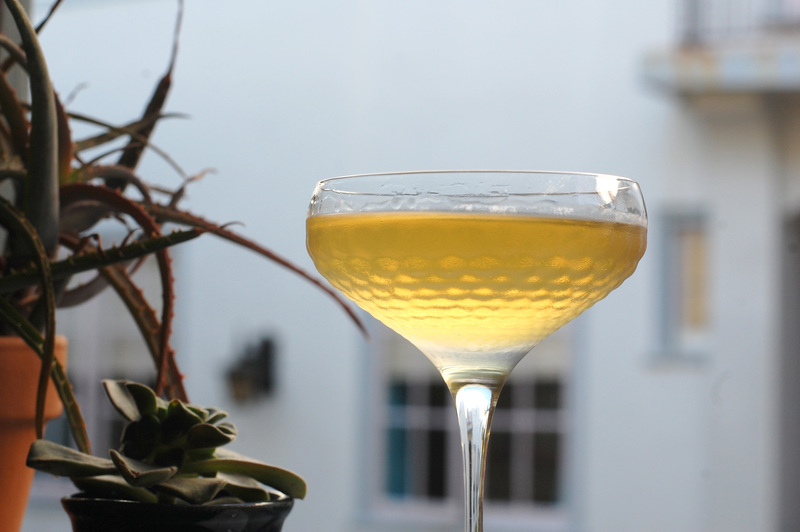 – my recipe for homemade aquavit, as well as a cocktail that features it. Combine all ingredients in a large jar and let sit for 2-3 weeks, depending on how strong you want it. Strain out solids through cheesecloth or a coffee filter and bottle (I like to put these kinds of things in swing-top glass bottles, which you can get at Ikea or Container Store). Stir all the ingredients over ice, then strain into a coupe. No garnish.